When the opportunity presents itself, I like to capture an image of people who are out of the ordinary. On a recent trip to the Bering Sea, we went ashore in Zodiac rubber boats at Nunavik Island. Greeting us was a small family of Yupik native people living there. Most were young, but this lady who was 90 immediately caught my eye. She was most happy to let us take photographs of her and others in her family. After I returned home and processed her photo, I began to wonder about all the things this lady had seen in her lifetime. 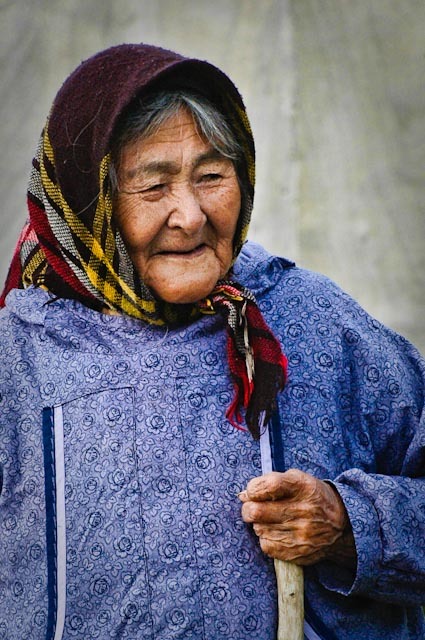 She and others living there are subsistence hunters, and have relatively few modern conveniences compared to most other places we visited on our exploration journey throughout the Bering Sea and Eastern Siberia. Regardless, I’m sure this lady has little desire for what we’d call “modern conveniences”.